They are usually inexpensive and not the first thing you think about when conducting routine maintenance on your Apache Sprayer. But, when you operate in dry, dusty conditions, filters are an especially important element to keeping your sprayer well-maintained. That’s particularly true considering the cost of the damage poorly maintained filters can cause down the road. Today’s modern filters are light years ahead of those in the past. More advanced designs and materials make air filters more effective in trapping dust and dirt that would otherwise reach critical system components and inflict damage. But, because they’re so much more effective and working in much more efficient engines today, they require more attention during routine maintenance, according to Apache Sprayers Senior Application Specialist John Casebolt. Working in dry, dusty conditions can accelerate wear on filters simply by virtue of the volume of sediment they’re filtering, as well as the heat that typically accompanies that kind of intake. But, generally, there are other signs your filters are clogged or not performing optimally. Sometimes they’re the first thing to watch for in diagnosing filters that are nearing the end of their operational lives. When cleaning air filters, it’s important to do so in a way that doesn’t alter or damage its structure or shape. It may be tempting to either knock dry sediments loose from the filter or use an air compressor that will get more of the loose material than cleaning by hand. These are likely overkill, though, and stand to potentially damage the filter worse than simply wiping the excess dust and sediment away gently by hand. The good news is that modern equipment, like an Apache Sprayer, typically has on-board diagnostics and warning systems that alert the operator when a filter’s performance is slowing down or being altered in a way that affects overall performance. But, don’t use those warning systems as the primary means of diagnosing filter issues. Casebolt recommends changing air filters at least once a year, or every 250 hours of operation, whichever comes first. For those who don’t operate that many hours in a season, it’s still important to change filters annually. Though it’s not common among farmers today, keeping a basic supply of filters on hand is a good idea, Casebolt said. If you have a replacement already on hand for when a filter needs to be swapped out, you can minimize the time to do the job. During the off-season, that may not be that big of a deal. But, during spraying season when time is money, it can be huge. Looking to purchase filters for your Apache Sprayer? Head to our parts store. Tip nozzles are among the least expensive components of a modern sprayer, but underestimating their importance and being lax with maintenance can quickly get costly. That makes it critical to test them and ensure they’re functioning properly before beginning a busy spraying season. Why is testing tip nozzles so important? A clogged or damaged nozzle can alter spray patterns, and depending on the chemical you’re applying, can have major implications for your crop, both in growth and weed/pest control. Testing your tip nozzles begins by knowing your nozzle size, spray pattern and the volume for which they’re rated. Having a firm grasp on these variables will help determine exactly how they should be optimally performing based on the required 40-PSI pressure. That pressure information is critical to have on hand when manually testing tip nozzles, Weaver said. Measuring the output of each tip for nozzle wear and tear is the basic testing procedure for justifying replacement, and there are both manual and automated (via rate controllers) ways to do so. If done manually, which typically gives the operator a better feel for the condition of his or her nozzles, Weaver recommends using a metering bucket, calibration jug or other container that can measure specific output levels for each nozzle. Once the system reaches 40 PSI, each tip should emit a specific amount of liquid. Weaver recommends testing each nozzle for either 30 seconds or one minute, though the longer you test, the more accurate your nozzles and spray pattern will be. This is where nozzle size comes in; the size dictates the amount of output per tip, and if that output is greater than that specified amount, the nozzle is likely to be damaged or worn. That means it should be replaced soon to prevent inconsistent and potentially damaging applications. Testing your sprayer’s tip nozzles is something that should be done at least once a year, starting when you perform pre-season maintenance on your machine. How often you need to actually replace your nozzles depends on use and nozzle type. To prevent further wear and tear on your nozzles, be sure to reference our Nozzle Maintenance 101 Guide. When Apache Sprayers transitioned to the ZF transmissions for the 2011 sprayer model year, operators had access to a new way to boost fuel economy and performance in the field through features like a locking torque converter. Like any drivetrain component, ZF transmissions require regular maintenance to perform optimally. Though it is fairly automated and offers a lot of safety features to simplify and streamline the process, it’s important to go through calibration at least once per season to ensure components are protected and the transmission is shifting smoothly, said Apache Sprayers Application Specialist Chris Smith. Many operators calibrate their ZF transmissions when performing routine service and fluid changes. “The process keeps everything within the recommended specifications, because over time, things are going to start wearing out. It helps minimize typical wear and tear by reading and recalibrating new clutch pressures,” Smith said. When calibrating a ZF transmission in an Apache Sprayer, the machine’s on-board computer — tied to its transmission control unit (TCU) — essentially takes care of the process for you. After the operator runs the machine to get it to operating temperature — around 180 degrees Fahrenheit — the TCU runs a diagnostic check of all clutch pressures and provides performance feedback. The process helps the operator stay on top of potential maintenance issues like replacing the system’s 15W40 oil as needed. In newer Apache Sprayer models, the TCU helps manage operations to optimize performance under different conditions. Ultimately, ZF transmissions help operators not only stay on top of key maintenance schedules, but do so with the highest level of safety, given the number of safeguards the transmissions feature. Are you calibrating your ZF transmission as part of your annual maintenance schedule? See what else you should be doing on a yearly basis with our maintenance checklist. Start here. Spraying agriculture chemicals can be a dirty and sometimes dangerous job. That makes it important to have an enclosed sprayer cab with a strong air filtration system, like today’s Apache Sprayers. Simply having a cabin filter system isn’t enough; it’s just as important to take the right steps to ensure it’s functioning properly, especially during the busiest time of year when farmers are spending a lot of hours in the cab. Apache Sprayers utilize a three-layer activated charcoal filter comprising a charcoal layer sandwiched between two paper layers with varying levels of filtration. The outer layer is pleated paper designed to catch the largest particles of dirt and dust from entering the middle layer comprising activated charcoal. The third inner-most layer is also paper, but is designed to catch finer particles that may have made it past the charcoal layer. The cabin filter is designed to do more than just trap dust and dirt particles. The middle activated charcoal layer traps chemical fumes and odors that can sometimes be dangerous to the operator. Though the lifespan of the outer paper filter layers is typically based on the number of hours of operation, the charcoal filter’s efficacy over time is partially determined by the speed at which you operate your HVAC fan, according to Apache Sprayers Senior Application Specialist John Casebolt. The reason for this deterioration is the charcoal’s contact with air in general. Activated charcoal’s long-term efficacy in preventing chemical fumes from entering the cab also depends on how the machine’s heating and air-conditioning system is used. If you crank up the A/C most of the time while you’re spraying, your charcoal filter’s lifespan will be adversely affected because of the increased airflow over the filter. Even when it’s not in operation, if the filter is installed and exposed to open air, it’s slowly losing long-term efficacy, Casebolt said. It’s an important factor to account for in how you store your filter during the off-season, just as much as accounting for how you operate during the season. Just as the machine’s A/C system can be the culprit of shorter cabin filter operating life, it can also be one of the first symptoms of a filter reaching the end of its life. When the filter stops working, it’s common for A/C systems to slow down or not function optimally. When is the best time to change your cabin air filter? “If you start noticing chemical odors in the cab, then it’s time to take a look at that filter and see when it was changed last, because that activated charcoal begins to deactivate as soon as it’s exposed to air. It doesn’t deteriorate as much when it’s just sitting there versus when air is moving across it, but it does happen,” Casebolt said. If there aren’t noticeable performance issues, the cabin filter should be changed at least once a year, depending on overall use. “Whether it’s more often than once a year depends on the hours on the machine and the conditions in which you’re running,” Casebolt added. Because activated charcoal starts deteriorating with any contact with the air, it’s also important to store filters in a way that minimizes that contact, thereby maximizing the functional life of filters containing the material, like Apache Sprayers cabin filters. Replacing cabin air filters is just one part of regular maintenance on an Apache Sprayer. Do you want more maintenance ideas? Start with our annual maintenance checklist. Spray drift continues to be a big issue for chemical applicators, and it has led to the rise of digital spraying technology that utilizes pulse-width modulation (PWM). The new sprayer innovation, available on every Apache Sprayer through the Raven HawkeyeTM system, helps operators more efficiently apply chemicals and sustain environmental and crop quality by preventing spray drift. When facing windy or inclement conditions but a spraying job must be done, the operator typically has to slow down the sprayer and back off application pressure. This is needed to effectively deliver chemical where it needs to without wind catching, taking it elsewhere and inflict damage to other crops or plants. Today’s PWM helps operators sustain more consistent field operations at speeds close to, or at the same level as, optimal conditions. Pulse-width modulation isn’t the newest technology in the world. Some manufacturers have been offering the functionality for more than a decade, but more recent advancements, spurred by increased scrutiny of the chemical application sector, have made new systems more functional and efficient in controlling drift. In the last five years alone, issues with drift and increasing overall chemical and crop input costs have amplified interest and demand for digital spraying and PWM. Pulse-width modulation, like that in the Raven Hawkeye system, uses solenoids at each spray tip that open and close a valve at the nozzle tip that “pulses.” The pulse of the valves’ opening is consistent, with the valve opening once every 1/10 of a second, and spray volume and droplets are applied based on percentages of the modulation’s “duty cycle.” A 25% duty cycle in a PWM system would result in a lighter application that would ordinarily require a low pressure. A 75% duty cycle, on the other hand, would mean a higher application rate. Through a sequence of valves constantly opening and closing, the system maintains more consistent pressure and makes adjustments via a central in-cab monitor based on operator adjustments accounting for weather conditions and map inputs. The system can also provide per-nozzle control, preventing spray overlap and allowing a higher level of application precision, and PWM allows more precise control of droplets even when running at ground speeds that would ordinarily prevent the required pressure from building to adequate levels for the chemical to reach its target plants. Pulse-width modulation makes it possible to eliminate the “run-down time” associated with conventional spray booms and nozzles, adding precision to the spraying process. It also provides operational flexibility, allowing the operator to spray at different speeds but maintaining the same coverage when conditions would otherwise keep the sprayer parked. Most importantly, it helps prevent spray drift since the pulse-width modulation helps better deliver chemical in a wider array of conditions – namely wind – without adjusting speeds or changing components. That, in turn, makes spraying operations more consistent and efficient by eliminating two factors that can add to overall spraying operations and their efficacy. That’s the primary benefit of pulse-width modulation. It helps the operator avoid spray drift by applying larger droplet sizes more consistently – and at a wider range of speeds – through the adjustment percentages in the pulse-width modulation system, not the actual overall system pressure itself. But, that’s not the end of its benefits. It also allows the operator to spray in conditions that might otherwise prevent it because of wind or other issues that influence drift and sprayer ground speeds. Other benefits come in the design of the Raven Hawkeye system. Because it manages sprayer booms in sections, the system creates up to 16 “virtual boom sections” that help precisely manage applications by providing shutoff capabilities through the solenoids and valves that otherwise manage each tip’s pulse modulation. Those cost savings are likely to be a mainstay on operations utilizing PWM, especially as Apache Sprayers continue integrating more technology as it develops in the future. In the end, it will remain critical for farmers to focus on connecting their uptake of new tools like pulse-width modulation with overall operational efficiency. Looking to upgrade your sprayer precision? Find out more about Raven Hawkeye and other precision options with Apache Sprayers. The key to smooth operation of any machinery is regular maintenance, and Apache Sprayers are no exception. Taking care of routine maintenance on manufacturer-recommended schedules is important to sustaining productive, efficient field operations over the life of your sprayer. Nowhere is that regular maintenance more important than the sprayer’s driveline, the collection of components that delivers power to the wheels and keeps the machine running in the field. Technology today can help in keeping track of important maintenance timeframes; however, it’s up to the operator to follow those timeframes, says Equipment Technologies Service Specialist, Tyler Gordon. “The scheduled maintenance app on the Apache display, now an option on new machines, can tell you what you need to do based on hour intervals,” Gordon said. 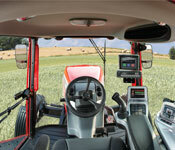 In-cab displays themselves are optional on all Apache Sprayers, but every machine is wired for one. That makes it easy to add a display later on. Even with the most advanced diagnostic tools, it’s up to the operator to follow the manufacturer’s maintenance schedules. First and foremost, routine driveline maintenance on Apache Sprayers starts with greasing the line’s eight universal joints every 40 hours of use. “When we talk about greasing the driveline, we also grease any axle or chassis frame component in that same 40-hour interval,” Gordon said, adding these tasks are typically always included in a routine inspection. In addition to the universal joints on the driveline, it’s important to check the sprayer’s rear differential every 500 hours, the same interval for engine oil changes and any planetary wheel drives and wheel gear dropboxes. The number of hours of use and overall treatment of a sprayer has a lot to do with its maintenance needs over time. With tasks like scheduled driveline maintenance, it’s important to stick closely to the manufacturer’s recommended timeframes, even if the calendar doesn’t match the machine’s overall use. Failing to do so can be costly in the long run. The Owner’s Manual for each Apache Sprayer includes a Lubrication and Maintenance chapter with manufacturer’s maintenance schedules. 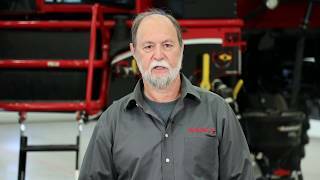 See more on driveline maintenance in the Apache Sprayers yearly maintenance checklist. After facing years of challenging grain markets, general farmer optimism is starting to rebound. As improving sentiment translates into making much-needed machinery purchases – including sprayers – it’s important for potential buyers to stay well-informed about local market conditions and how factors like available inventory and demand influence prices. At the same time, it’s important to continue planning for the long term and not make cost containment the sole driver of sprayer purchases, especially considering the return on investment a new sprayer can offer most farm operations. Here are a few tips from Clark McGrath, Iowa State University Extension field specialist, and Greg “Machinery Pete” Peterson that can help buyers best navigate the sprayer market in the coming months. By watching local machinery market conditions, sprayer supplies and grain market prices, farmers can equip themselves with the right buying attitude ahead of what could be a “major rush” for both new and used sprayers. Peterson said that’s likely to happen once the grain markets start to correct, revenues rebound and buying habits return to what was “normal” before the downturn. While being more aggressive as a buyer can pay dividends in today’s market, it’s more important than ever to ensure you’re sticking to your operation’s long-term budget, McGrath said. On most operations today, that means accounting for both the cost of purchasing and maintaining a sprayer as well as paying for continued custom applications, which producers who operate their own sprayers still rely upon for some of their application work. Owning a self-propelled sprayer enables you to take care of the bulk of your spraying operations. But, it may not take care of all applications. Don’t enter a sprayer purchase with the expectation that you can handle everything, and take labor and time into account when examining the cost of ownership and management before buying. If you’re operating your own self-propelled sprayer for the first time, you’ll likely have more flexibility to take care of your own applications, and that can lead to crop yield improvements. It’s a good idea to set expectations for just how much yield you stand to gain through well-timed applications. Improved yields will mean improved crop revenue, and that can help offset some of the cost of the sprayer. When starting the purchase decision-making process for a self-propelled sprayer, it’s important to think not just about immediate needs, but also look ahead through the expected life of the machine or length of time you’ll own it. Technology will likely advance during that time, and adopting that new technology will carry with it additional costs. Ultimately, it’s important to make sure you’re accounting for both those types of costs and how well the machine will meet your needs in the field. Are you in the market for a self-propelled sprayer, or do you want to learn more about the ROI of a new sprayer on your farm? Get in touch with our team for a sprayer quote and to learn more. The process of direct injection means the primary tank contains only water, and since mixing happens in-line, there is no chemical actually entering the main tank. The result is less chemical waste, faster, more efficient mixing in the field and quicker clean-out after you’ve gotten the job done. The ability to move from field to field and spray different chemicals with minimal time and effort between applications used to be a pipe dream for busy sprayer operators. Not anymore. For every Apache Sprayer, from the 2017 model year on, an optional direct chemical injection provides operators the ability to mix concentrated chemical in-line via an on-board 50-gallon tank. The capability to inject in-line directly without chemical entering the primary tank has benefits beyond just convenience for the operator. With high chemical costs and issues like herbicide resistance continuing to plague chemical applicators and farmers, direct injection helps keep chemical where it needs to be going and minimizes the potential for weed resistance, on top of cross-contamination. “Demand has picked up because of potential chemical cross-contamination for different chemicals, especially as weeds are becoming more resistant to one particular chemical or another,” Smith said. Ensuring a direct injection system works properly is “extremely easy,” he added. In the on-board product controller, products and rates are selected and, based on ground speed, the chemical is injected into the lines and booms directly without coming into contact with the primary tank. Do you want to see the Apache Sprayers direct injection system at work on your farm? Sign up for a demo today.